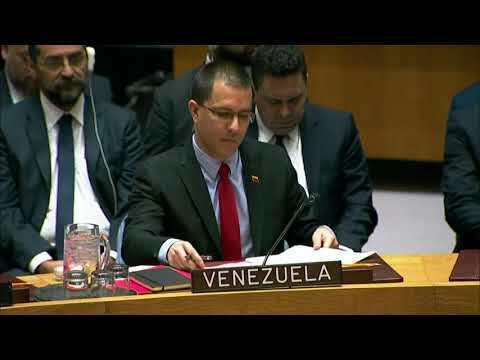 CARACAS, Venezuela (AP) — Nicolas Maduro’s government backtracked Saturday from its order for U.S. Embassy personnel to leave Venezuela, moving to defuse tensions with Washington just hours after international diplomats traded heated rhetoric at a special U.N. Security Council meeting on the South American country’s crisis. The socialist president broke relations with the United States on Wednesday after the Trump administration and many other nations in the region recognized opposition leader Juan Guaido as Venezuela’s interim president, a move that Maduro called a “vile” coup attempt. But as the sun set on Venezuela’s capital, the Foreign Ministry issued a statement saying Maduro’s government was suspending the expulsion to provide a 30-day window for negotiating with the Trump administration on setting up a “U.S. interests office” in Venezuela and a similar Venezuelan office in the United States. The U.S. and Cuba had a similar arrangement for decades before the Obama administration restored diplomatic relations with the communist-run island. Earlier in the day, critics and supporters of Maduro’s government faced off at the U.N. Security Council, reflecting the world’s deep divisions over Venezuela, which is mired in political confrontation as well as an economic collapse that has caused millions to flee the country. Russian Ambassador Vassily Nebenzia charged that the Trump administration is trying “to engineer a coup” against Maduro. He said Venezuela doesn’t threaten international peace and security, and he accused “extremist opponents” of Maduro’s legitimate government of choosing “maximum confrontation,” including the artificial creation of a parallel government. Arreaza said Venezuela “will not allow anyone to impose on us any decision or order” and demanded that someone show him where in Venezuela’s constitution says an individual can proclaim himself president. It also threatens to worsen the country’s economic crisis, as directives sent Friday by the State Department to the Federal Reserve will make it harder for Maduro to gain access to the government’s sizable overseas assets, including revenue from oil sales and profits by Houston-based Citgo, a unit of the state-owned oil giant PDVSA.